The madman that dragged everybody else into this damn fool game-crusade! 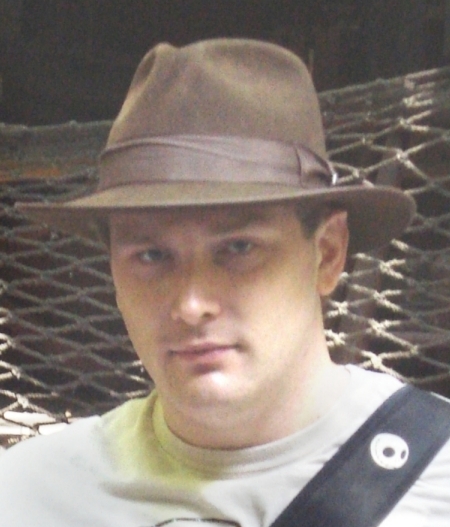 Matt is the owner and main writer of our game products. Eccentric at an early age, Matt has been creative his entire life. He was the one that would get in trouble in school for drawing pictures of his favorite fantasy films rather than paying attention to the lesson at hand. In Grades 2-4, he put on an annual year-end puppet show for his class. But while he continued to pursue his creative endeavors privately, he shunned larger, group-related activities, save for a high school drama class, and his lavish Holiday displays that sometimes make the front page of the newspaper. Beginning as a sketch artist, Matt was drawn into writing (adventures) in a need to keep his house's role-playing game alive. This exploded in the early 1990s when his passion for the game drove him to begin the formation of his own game system and setting, beginning what would eventually become the legacy of Fantasia. While his friends' interest in the game continued to fade because of their age (late teens), Matt continued to nurture his growing projects like a mad scientist, rarely eating, barely sleeping, shunning school and career opportunities. Many, many frustrating years only fueled his creative fire to create games that would draw people back into the world of intense, imaginative role-playing. At the turn of millennium, he was ready to reveal his work to the world at large. Matt deMille has been described as living in the past where the game industry is concerned, being both a hopeless romantic and one who, due to age and sheer bad luck, only became interested in role-playing games at the trailer-end of what he calls the First Golden Age of the industry, ending in about 1984. Indeed part of him lives there, drawing on the aspirations for these games before they were corrupted by greed and politics, but he also pays close attention to the present market, and even looks ahead to how these games may evolve. He combines the best of the past, present and future to make games that are indeed timeless. Just as independent film-makers are ever at odds with the Hollywood juggernaught, so is Matt up against the formulaic game industry governed by demographics.